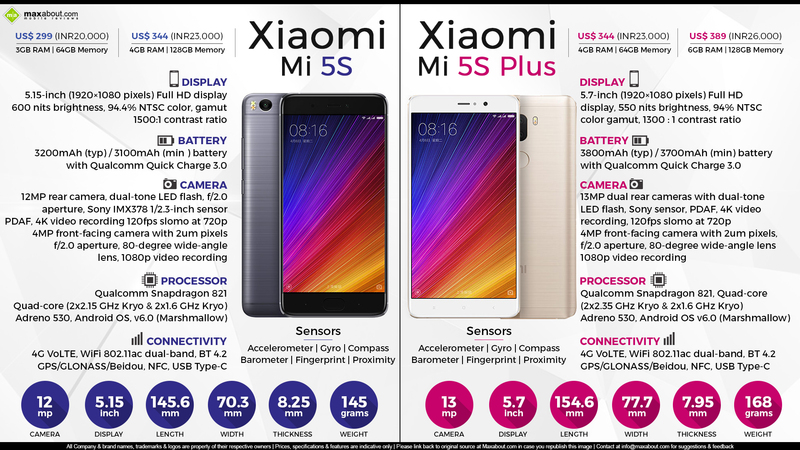 Xiaomi recently announced the flagship Mi 5S and Mi 5S Plus in China. The phones will rival the recently launched Apple iPhone 7 and iPhone 7 Plus in various international markets. The phones are loaded with impressive specifications and carry an even more refined design than ever launched in a Mi series phone. The phones are simply beautiful. Mi 5S comes with a 5.15 inch, full HD curved display with MIUI 8 interface on it (based on Android Marshmallow 6.0). The processor powering the same is Quad-core (2x2.15 GHz Kryo & 2x1.6 GHz Kryo) Snapdragon 821 with Adreno 530 GPU and comes in two different memory option. The first on offer will be 3GB LPDDR4 RAM and 64 GB internal storage while the second is 4 GB LPDDR4 RAM with 128 GB of internal storage. The phone comes with dual SIM option and uses a 12 MP rear camera with dual tone LED flash while the front is a 4 MP wide angle lens camera with 1080p support. It carries impressive specifications like ultrasonic fingerprint sensor, 4G VoLTE, NFC, USB Type-C and a 3.5 mm audio jack. The battery used on the Mi 5S is 3200 mAh. The much bigger 5S Plus come with 5.7 inch, Full HD 2.5D curved glass display and Quad-core (2x2.35 GHz Kryo & 2x1.6 GHz Kryo) Snapdragon 821 64-bit processor with Adreno 530 GPU. It comes with 13 MP dual cameras for better imaging at the rear. The memory options for the bigger phone are even bigger with 4GB RAM and 64 GB internal storage in one variant while a massive 6GB RAM and 128 GB internal storage in the other. It uses a bigger 3800 mAh battery.